An attainable attendance record and the return of Chandler Rogers headline reasons to come out Friday night. The Cowboys wrestle Big 12 foe Air Force on Friday night in Gallagher-Iba Arena. 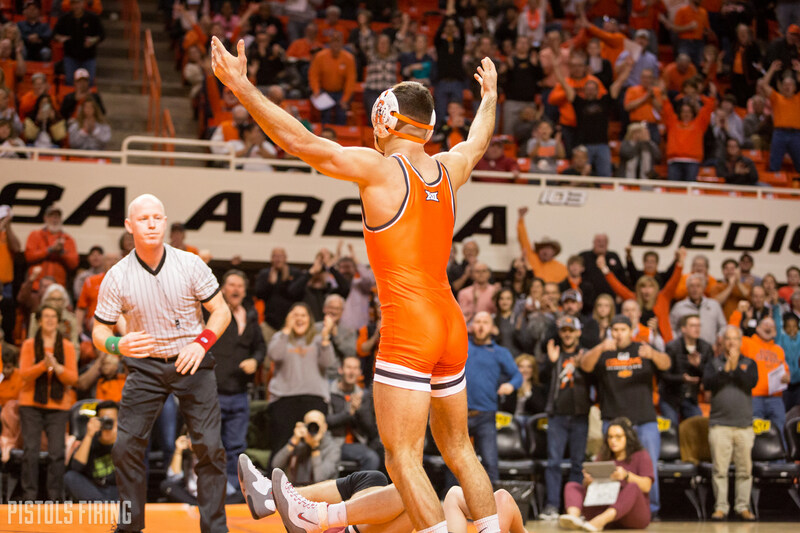 OSU will be pretty heavily favored in this one, so rather than a full breakdown of dual expectations I thought I’d give you five reasons to watch. Let’s dive in. I’ve dug into a bit here, but an average attendance record is in play for OSU this season. The Cowboys didn’t have great numbers the last few duals, but they now need 14,681 total attendees in the dual Friday along with the final vs. Iowa to break that record average. In the last home dual vs. Iowa there were a total of 7,809 attendees. I actually expect more at this one. There are a bunch of big matchups, high school/youth wrestling in the state is over at that point, basketball is down, and there are other factors that I believe support a bigger crowd for OSU this season that I think could put the number in the range of 10,000. That said, OSU will still need at least a decent crowd in the 4,000-plus range to have a shot at the record in my opinion. It sounds like the always exciting Chandler Rogers will be back on Friday after a long stint out of the lineup with injury. It’ll be interesting to see how he wrestles in his first time out since the Southern Scuffle. It’s not senior night. To my understanding that will be vs. 3rd-ranked Iowa. In a big dual like Iowa it’s unlikely we see some of the seniors that aren’t regular starters get their opportunity to wrestle a match in GIA. But they may do that in spots here vs. an Air Force team that won’t challenge in the overall dual. That’s a cool moment for guys that have put in a four- or five-year body of work in the room and don’t get much recognition for it. The Air Force Color Guard will kick things off with the playing of the National Anthem and OSU athletics will take a moment mid-match to recognize servicemen and women. Tickets can be purchased for $3.00 online with the promo code: 19wrmilitary. If you haven’t been made aware John Smith is a show in himself. Between his hilarious quotes, his mannerisms on the bench, and being the greatest American wrestler ever he’s one of the more intriguing things to watch in each dual. When: Friday November 8th at 7 p.m.